This newsletter was supposed to be about the progress we are making in terms of building out Exante Data as a business. But given recent developments in Europe, I am going to comment instead on the emerging cracks in foundation of the European Union. Back in 2010-2012, Greece was Europe’s Achilles Heel. It was a very uncertain time, and I spent most of my awake hours thinking about Europe’s structural vulnerabilities. I even ended up writing a book about the Euro-crisis and the future of the Euro (it was dramatically titled The Fall of the Euro when published by McGraw-Hill in 2013). The key message of the book was that the future of the Euro would be determined mostly by politics, and less by economics. With the ECB providing an improved backstop infrastructure for banks and sovereigns, it would take more than a mainstream financial crisis to splinter the Euro. A breakup of Europe’s single currency would require a full-blown political crisis in the region. In the period 2013-2015, Eurozone financial markets were more stable. Renewed instability in Greece in 2015 no longer rocked other Eurozone markets much (the better backstop from the ECB has changed the market psychology). For a time, greater financial market stability and some improvement in growth (albeit moderate) even improved public opinion about the Euro and the EU on the margin. Over the last six months, however, political risk in Europe has been rising again. 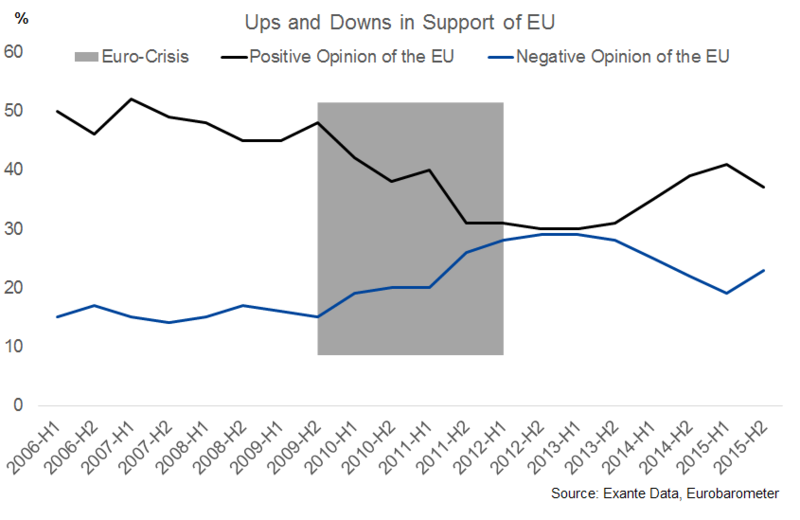 The Euro-crisis is still having a lagged political effect. 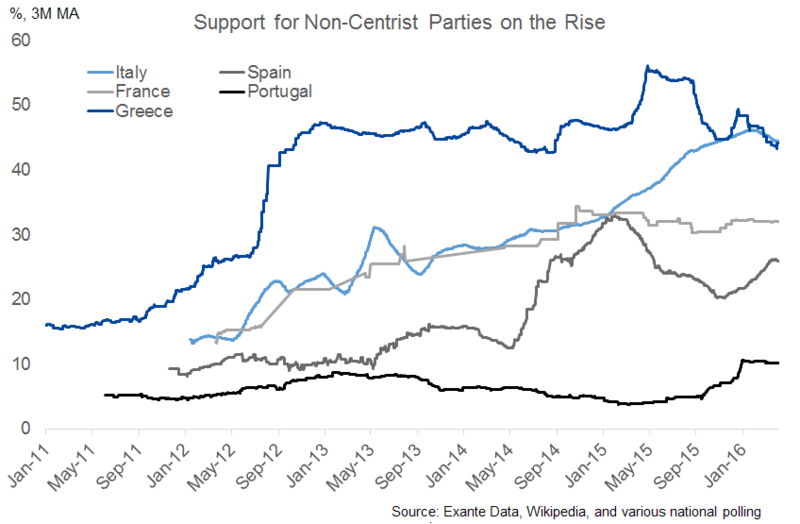 Centrist political forces have been losing power; not only in Greece, but also in Spain and Portugal. This new reality is a clear break from a multi-decade long trend, where the mainstream centrist political parties were in power in almost every part of the European Union. Meanwhile, the refugee-crisis is threatening a shift in European politics of even bigger proportions. 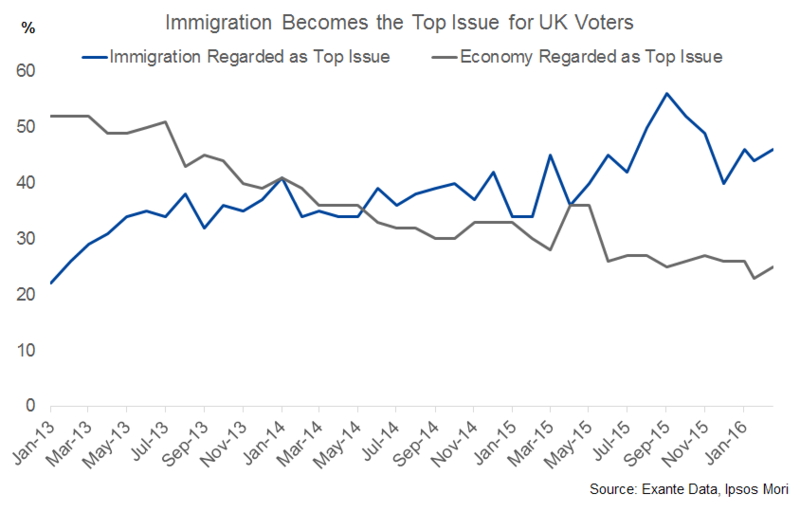 Immigration has jumped to the top of the list of the most important issues in most EU countries, including in the UK. There is little doubt that the immigration crisis is Europe’s New Achilles Heel. This means that the standard economic arguments (whether you believe them or not) against Brexit are much less relevant than they used to be. The outcome of the UK’s EU membership vote on June 23 will be determined by emotions, particularly concerns relating to immigration. The Pound is down 15% against the Euro so far this year, and the uncertainty around the UK’s future in the EU is the key driver. It is the most dramatic move in the GBP since the Global Financial Crisis, and it illustrates the power of political forces. It is just one example that sometimes it is not the GDP data or monetary policy news that matters the most for markets. Sometimes politics dominate everything. Cracks are emerging in the foundations of the EU. Underlying institutional weakness associated with an unfinished political union are being exposed by the escalating immigration crisis. As the cracks widen, political variables will matter more and more. That is why we are tracking political data very closely. Sign up to receive exante data's newsletter, with updates on new products and business developments. By checking "Accept" you consent to the personal information provided by you on this form being stored and used solely by Exante Data to send you newsletters and other information Exante Data may wish to share with you.